Lost souls are wandering the graveyard and attacking the living! As the Spirit Bridge, you have the power to sooth these angry spirits, then guide them to a resting place. 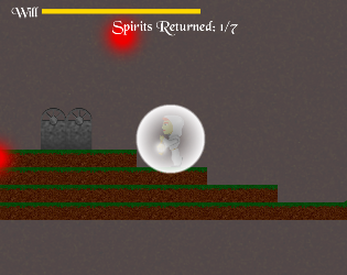 Focus your lantern on spirits with the left mouse button. Shield yourself with left control or the right mouse button. Your task is complete when you return all of the spirits to tombstones. Made for Ludum Dare 30 Jam in three days. Music: "The Pyre" Kevin MacLeod (incompetech.com)"
Like this game? Try my long term game project, Intergalactic Bubbles.